You are currently browsing the tag archive for the ‘Shannon Keith’ tag. 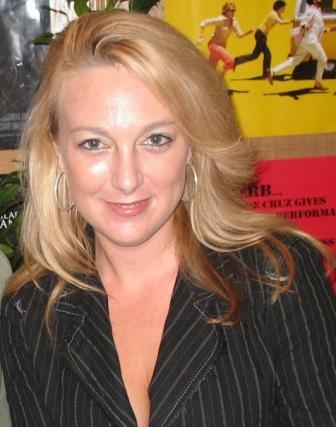 Shannon Keith is a Los Angeles-based attorney and filmmaker, perhaps now best known for her powerful 2006 documentary Behind the Mask, which introduced audiences around the world to the activism of the Animal Liberation Front. In 2004, she started a non-profit group called Animal Rescue, Media & Education (ARME). ARME rescues homeless animals and focuses on stopping the problem at its roots through educational initiatives, including making documentaries about animals and animal activists. In court, Shannon has represented such animal activists as Kevin Jonas, SHAC and Sea Shepherd Conservation Society. She is now working on her second documentary. Although I knew of Shannon and her work on behalf of animals and activists, I was able to learn from her firsthand at the Let Live conference in Portland last June. Shannon is a dedicated animal activist with a valuable perspective on the movement. Shannon, what news can you share about your next film? Skin Trade is going to be slightly different than Behind the Mask in the sense that it will be geared toward a greater spectrum of people. Skin Trade will have all new experts, new footage, activists and celebrities talking about the fur industry. The message of the film, which is anti-fur, will really hit home because of the emergence of fur in the fashion industry in the last couple of seasons. Even though the film is anti-fur I am going to show both sides of the fur issue — something that I think will add credibility and strength that will be undeniable to the average “Joe” on the streets watching an animal rights film. It sounds compelling. When will the public be able to see it? Oh, it’s not done yet. We expect it to be completed by January 2009. Your activism seems to have two main prongs: your work as an attorney defending animals and activists, and your work as a film producer of documentaries. How do these two influence each other? As far as being an animal rights attorney, the documentaries help explain to the general public and even individuals in the movement what it is I do, and who I defend. With regards to Behind the Mask, it really seemed to clear the air not only on who or what the ALF is about, but why I defend direct action activists. The media and government unjustly call them “terrorists,” and as their defense lawyer I get labeled one as well. A lot of people would ask why I defend such “violent domestic terrorists,” but after watching the movie the subject seems to be much clearer to them. With Skin Trade, I hope to have the same result but more so with my other clients, the animals. I want to portray the cruel realities of fur but target it to the general public. Hopefully, it will be clear why it is that I chose a career defending animals. Now that Behind the Mask has been out for a couple of years, what has the impact been? The impact has been tremendous. I cannot even begin to explain the extensive ground it covered. Behind the Mask really hit home to the people already in the animal rights community and sparked almost this euphoric passion in them. The progress we make for the animals is slow and sometimes we lose some activists and the film really seemed to rekindle that fire we all share. The impact the movie had on the average citizen, not into animal rights, was equally as great. I get emails all the time about how it changed people’s lives and helped them become vegetarian, adopt a cruelty lifestyle, go vegan, stop purchasing animal-tested products or how wrong they were about the ALF. It’s amazing! Behind the Mask argues that peaceful activist tactics like writing letters don’t work — that direct action is really what brings change in social justice movements. Do you think there are any above-ground strategies activists can do to effectively advocate for animals? Yes, I do. But I believe they have never worked alone; meaning, when we have seen change happen through protest, it has been because there were more radical factions working in conjunction with above-ground activists, whether known or unknown. In fact, I believe it is imperative that for the underground actions to be effective there are above-ground campaigns in place at the time. I still believe in traditional protest activity, as well as trying to change the law through the legislative process. People who are not willing to do any of these things can simply boycott animal cruelty, by not spending their money supporting these companies and industries. I was really impressed with your presentation at the Let Live conference in Portland; I was especially surprised to hear you say police will lie to activists when confronting them. Would you expand on that a bit? Police and FBI, and any other law enforcement for that matter, are allowed to lie. They are allowed to tell you that if you do not talk with them, you will be arrested. That’s why it is so important for activists to know their rights. One should never talk with government officials or provide any information, even if they think they already know it. Keep your mouth shut, or assert your right to remain silent or have an attorney, at which point they are legally required to stop questioning you. With the Animal Enterprise Terrorism Act and other legislation clearly intended to intimidate activists, what long-term role do you think direct action will play in animal activism? The repression perpetrated by the governments in enacting unconstitutional laws such as AETA, etc., is only backfiring. Because legal protest is now sometimes illegal or activists are deterred, they have gone underground. Since the passage of AETA, I have heard of more underground direct actions than before AETA. What do you do to keep from getting burned out? That’s a good question. I try to keep my head in the game and never forget of the pain these animals suffer. But, I try my hardest to have a good time when I can, because if I don’t, I will burn out. I love hiking with my companion dogs and going out with friends and NOT talking about animals sometimes. Do you think Spain’s decision to grant rights to great apes offers us any hope that courts may one day regard all animals as more than property? Any win for the animals, here or abroad, should be a sign of hope. The animal rights movement is one that requires a process that can sometimes be daunting and long. Every time we hear of any sort of inch being given over to us means we should pull that much harder on the proverbial tug of war we are playing here. Spain granting rights to greater apes is a catalyst to rights being given throughout. The day will come when we pull and all the exploiters, and animal abusers direct and indirect, fall in the mud. If we can make them budge even an inch, we can make them budge again and again. What advice do you offer activists who are interested in using the legal system to advance the interests of animals? The spectrum of animal rights law is a not a very populated one. I advise that working for animals in the legal field will help to show how serious we are about our cause. It takes dedication, hard work, perseverance and motivation to become a lawyer, and especially to become one not for the money, but for a cause. The more legal representation we have in the animal rights world, the bigger the chance we have to get into politics and make changes for the well-being and freedom of the billions of animals constantly tortured and murdered for the most trivial of reasons.